Alignment and I have an understanding. This understanding is I don’t rip sections out of every single rules book I own that deal with it and thereby I can continue to blissfully ignore its continued existence and keep it out of my games. Type ‘Alignment Meme’ into your browser, image search it. Take a look, I’ll wait. Excellent. There are a lot, a ton even. They all have one thing in common. 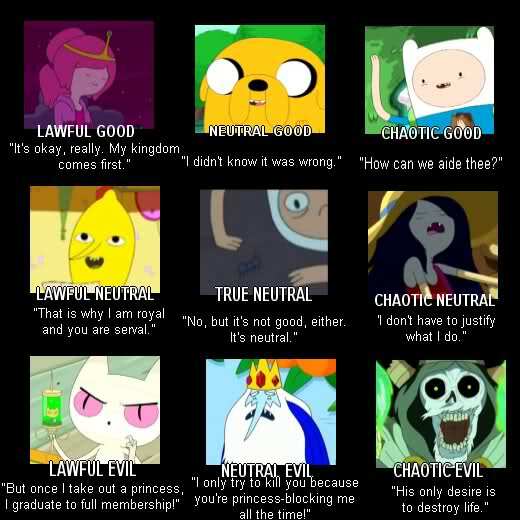 Each person represented by their alignment has never uttered ‘I am Lawful/Neutral/Chaotic Good/Neutral/Evil.’ Outside of maybe playing a divine character who channels power from his/her deity it’s a non-issue. Chances are while perusing the memes you found at least one person/thing you felt did not fit the prescribed alignment. It’s not a good rubric and people have a wide variance in what they believe comprises a title like ‘Chaotic Good’. When faced with X situation the character would decide to do Y based on played history/interactions and what seems feasible based on the character’s alignment. Alignment is supposed to be a tool to help us play the game not hinder the playing of it. I can’t do X because my character is of this alignment is unacceptable. Even then breaking alignment or shifting alignment is a non-issue unless you’re playing a divine character. There is no incentive to play to the alignment and no penalty for playing against it. I suggest replacing it with Seven Virtues & Vices. Based on the Seven Deadly Sins and their corresponding Heavenly Virtues. At character creation you can either roll a d6 to determine where a person is or start in the middle between three and four. Get extra classy and add one or two personal soft spots for each character. This system is a sliding scale between Virtues and Vices. When a situation arises in which the PC’s morality comes into question they would make a d6 roll. Ben is a sellsword who is in talks with a client to clear out a mine infested by giant spiders. The client is offering 50 gold for the service. Ben needs to determine how he feels about the price. Ben has a 3 in Charity/Greed (he’s a little more greedy than the average person). – Ben rolls a 1, something strikes a chord with him and Ben is moved to an act of Charity. This can be played by the player in any sort of fashion. He may decide to do the job at ½ price, for free, or he makes a decision to give some of the contract price to a good cause other than himself. – Ben rolls a 5 and the lure of gold is too much. The sellsword’s Greed kicks in and he aggressively negotiates towards a predatory price. He may or may not get the price but the greed has hurt his image with the client and community. This may also have a belated effect. Once Ben cleans out the mine he may hold it for ransom to the client or hand it over to someone else for a better price. He moves his Charity/Greed marker down to 2 making it even more likely his greed will get him in trouble later. – Ben rolls a 3. He does not move the Charity/Greed marker and is free to pursue whatever option he would like without interference. Obviously this is not the sort of mechanic you want to use for routine situations as it slows down play and can make some characters behave too randomly. Even the example of a contract price is a quite mundane situation to use the mechanic. But the mechanic can provide some role playing highs, it the difference between a normal dungeon crawl with spiders and clearing out a mine you might decide to sell to the highest bidder or take up as a base of operations for yourself (Ex. Way too many Elder Scrolls bandit/cultist hideouts). This mechanic works best when its built into the preparation by the DM/GM to complement those big, watershed plot moments. The most important thing to remember when it comes to this or any alignment system is the system is supposed to be an aide and tool, it should never be a hindrance to play but an enhancement. Encourage the use of your preferred rules system’s resources. The player rolled a result he doesn’t like, allow him to spend bennies, fate points, action points, etc. to change the result. Did you try the system out, have a different alignment/morality system you use? Leave some comments or leave a request for a topic for me to tackle. This entry was posted in DMs, Game Mechanics and tagged 4e, D&D, D&D Next, DM, DND, Dragons, Dungeons, Game, Game Mechanics, RPG by redraggedfiend. Bookmark the permalink. I am also not a fan of the traditonal alignment system and dislike systems that have it baked into the core rules thus making it difficult to ignore. when i play a character tied to a diety I usually look to the themes or ideals that they represent and incorporate those into my demeanor or motivations. I too tend to throw away the alignment system because of its limited and the trapped feeling it gives players. I like your idea the sins/virtues system and I have point I wish to add to. The idea of leaving a moral choice up to the roll a die would defeat e point of having an alignment although you did account for that, not the way I would. I would say each character inherent virtues and vices and they only have to roll for them if they would go against said virtue/vice. In summary, I’m glad this is something other people see as a strange mechanic too. P.s. there are something like 40 iterations of batman he is all of the alignments. Honestly I’ve never played with anyone who really enjoyed the classic 3 x 3 alignment system. As stated rolling a temptation of virtue/vice is not something you do in every situation. If you’re generally chaste fighter wants to chase lusty bar maidens in his off time or not, no biggy. But if he is being tempted by the sounds of a raucous party in the common room downstairs instead of laying low out of sight in his room, then it’s dice time. Being generally ‘Chaste’, let’s say it’s sitting on a 5, that means at a critical moment he will not be swayed by lusty bar maidens over 80% of the time. It’s meant under the stress of a situation to see if a certain person succumbs to temptation or not. It is beyond their rational self-control. Truthfully the core of the system working in play is because the exception is exponentially more interesting than the expected when it comes to characters, especially when success is hanging on a character to act a certain way. Flawed characters are more interesting, deeper, and more believable. Especially when their morality slides back and forth with their choices, such as the slow descent from a Jedi to a Sith, anyone affected by the One Ring, or someone trudging the path of redemption. ← Previous Previous post: FLGS!